DESAROLLARA CON UNA GRAN PARTICIPACION. LO PRIMERO ES AGRADECER A TODOS LOS PARTICIPANTES, PADRES Y SEGUIDORES POR TODOS SUS COMENTARIOS Y FELICITACIONES QUE RECIBIMOS POR LA ORGANIZACION. QUIERO DAR UN AGRADECIMIENTO MUY PARTICULAR A D. EUGENIO ORTEGA QUE NOS ENVIO LAS FOTOS QUE PODEIS OBSERVAR Y UN EMAIL CON SU FELICITACION Y CRITICA DE LA CARRERA. A PESAR DE NO SER LA ESPECIALIDAD DE NUESTROS CHICOS, TRABAJARON BIEN Y DEMOSTRARON QUE TAMPOCO SE LES DA MAL LA BTT. UN COMPETITIVO SERGIO CURIEL DEMOSTRÓ QUE LA BTT TAMPOCO SE LE DA MAL. FIRMO UN TERCER PUESTO SEGUIDO DE UN SORPRENDENTE JAVIER DE ROA EN UN MAGNIFICO CUARTO PUESTO Y RODRIGO GARCIA SE LUCIO CON UN MAGNIFICO SEPTIMO PUESTO. MENCION ESPECIAL MERECE NUESTRO PRINCIPIANTE SERGIO GARCIA CON UN OCTABO PUESTO MUY TRABAJADO . 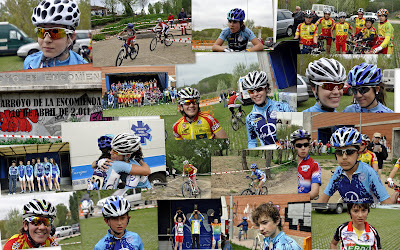 FELICIDADES CHICOS Y ADELANTE A SEGUIR PROGRESANDO. EL CLUD DEPORTIVO CICLISTA LA CISTERNIGA AGRADECE LAS FELICITACIONES QUE NOS DIERON TANTO LOS CLUBS COMO LOS PADRES Y SEGUIDORES Y TAMBIEN ASUME LAS QUEJAS QUE SE NOS HICIERON DE "CORREDOR DOBLADO CORREDOR ELIMINADO" CONSTE AQUI QUE NO FUE DECISION DE LA ORGANIZACION, FUE DECISON ARBITRAL A LO CUAL YA ME APRESURE A MOSTRAR MI QUEJA COMO PRESIDENTE DEL CLUB, PUES CON 4 ARBITROS BIEN SE PUEDEN CONTROLAR LOS DOBLADOS. LAMENTO PROFUNDAMENTE QUE HUVIERA CHICOS QUE MARCHARAN DESILUSIONADOS Y QUIERO DARLES MI PALABRA QUE SI PARA EL PROXIMO AÑO LO VOLVEMOS A ORGANIZAR ESTO NO OCURRIRA. A TODOS ELLOS QUIERO DARLES CON MI APLAUSO UN ABRAZO ESPECIAL PARA QUE SIGAN SUPERANDOSE. A LOS PADRES Y AFICIONADOS DECIRLES QUE LES SIGAN APOLLANDO Y QUE EL CLUB DEPORTIVO CICLISTA LA CISTERNIGA ES CONSCIENTE DE QUE HAY QUE HACER DE ESTAS PRUEBAS UN ESPECTACULO EN EL QUE TODOS LOS CHICOS LO PASEN BIEN INDEPENDIENTEMENTE DE LOS PUESTOS QUE OCUPEN AL FINAL.